A good majority of the general population would know that cardio is an excellent way to get in shape and lose some excess fat. But by cardio, the first thing that everyone thinks instantly is running; by that extension, everyone who is trying to get in shape, therefore, runs. Why run? Almost everyone who has tried their hand at it thinks it’s dreary, so why subject yourself to that? Well, it’s all in the name of getting fit and healthy. For some, it’s to get that perfect body. In this article, you will discover a brand-new way to get better results with far more excitement that running can provide. This exciting substitution of running is called cardio kickboxing. So, what is cardio kickboxing? And even more so, what is kickboxing? Kickboxing is a form of martial art that combines boxing and some elements of karate, particularly kicking with bare feet. 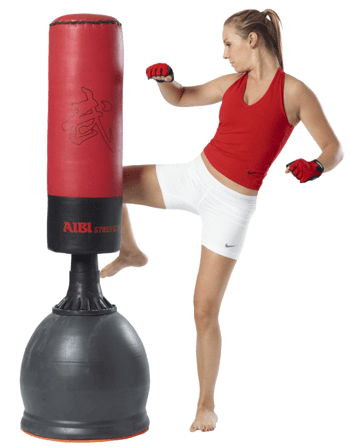 Cardio kickboxing, also known as aerobic kickboxing or fitness kickboxing, is actually a mix of martial arts techniques with fast paced cardio. This is a high-energy workout that challenges everyone of all ages and fitness levels. The cardio kickboxing calorie burn can range between 600 to 888 in an hour, with the varying factor being your weight and intensity of the workout. In comparison, an hour of running can only burn up to an average of 557 calories an hour given that you are running at six miles per hour consistently. So, how should you go about doing this kickboxing cardio? It shouldn't be too difficult finding a local gym near you that offers a class that teaches you how to kickbox. However, if you don't want to shell out some extra money for a gym subscription, you can definitely do a couple of kickboxing routines right in your home. Many think that an at home kickboxing workout routine would be inefficient, but the next couple of cardio kickboxing routines and kickboxing exercises that we are about to share with you will prove them wrong. The following kickboxing moves double as kickboxing training and are often used as boxer cardio workouts. These would be excellent cardio kickboxing routines for instructors to take note of too, as they would be excellently incorporated into any workout. Firstly, there would be a couple of kickboxing moves to learn. Once you understand how the moves work, you can incorporate them in a kickbox combo to form your own cardio kickboxing workout. Jabs: a straight punch from your non-dominant arm. Hook: a punch that is done in a hooking motion that aims at the side of the opponent’s head. Uppercut: a punch that is done in a vertical hooking motion that aims at the opponent’s chin. Shin Block: bringing your knee up toward your chest and drawing your elbow of the same side toward your knee in a crunching motion. Knee: drive your knee forward toward the opponent. Stance Switch: quickly hopping and shifting positions of your feet bringing them back and forth. 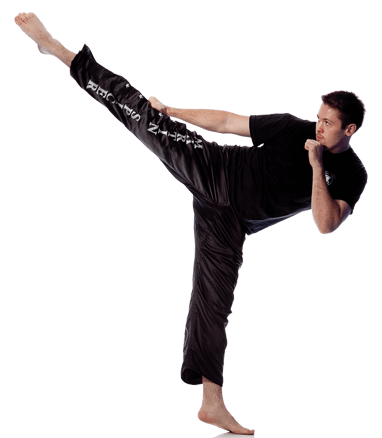 High Kick: Stance switch to bring your hind leg forward and then bring up your new hind leg up in a kick with a twist in your hip. These are basic techniques that you should know for a good foundation of kickboxing. To practice these moves, you can try the kickboxing workout with a bag, or without. But if you do have a sandbag to practice with, be sure that it is either hung up on the ceiling securely or attached to a kickboxing stand. This quick routine is a great way to start kickboxing at home for beginners. This workout can burn an estimated 10 to 15 calories per minute. This quick routine centres on your footwork and legwork and can be done at a beginner level. Like the previous routine, this workout can burn an estimated 10 to 15 calories per minute. For a full workout, you can combine both routines to get a well-rounded workout blast! There are several kickboxing workout benefits when doing routines like ones listed above, such as stress reduction, self-defense, getting a full body workout, weight loss, and even better posture and flexibility. One of my favorite things about this type of cardio workout is that it works your abs and core incredibly hard! So, not only do you get yourself in shape, it would also give you the flat tummy and abs that many celebrities also have. It is no coincidence that many of your favorite stars do kickboxing to keep themselves in incredible shape. For all the instructors reading this, do take note that this is also an excellent boxing ab workout and would get all your fighters in great shape as it keeps their cores taut and strong. So now that you have the basics of kickboxing and its benefits, what are you waiting for? Go on and try this workout for yourself!